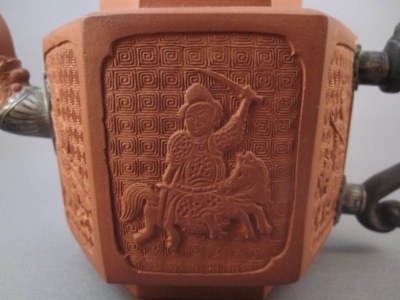 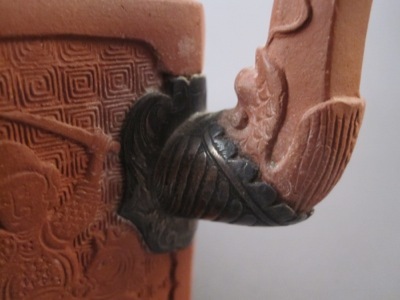 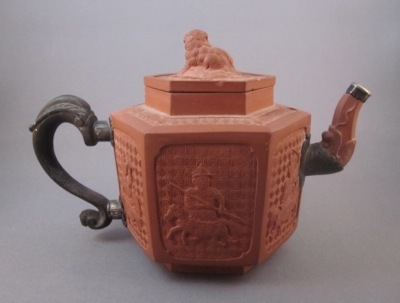 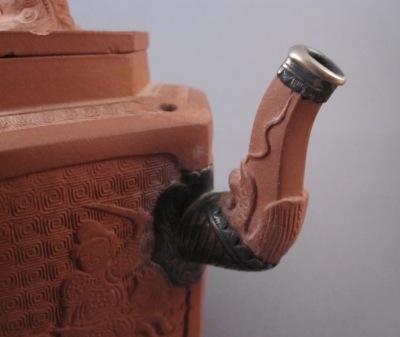 I purchased this little teapot thinking it was an example of Chinese Yixing ware with an elaborate early repair. 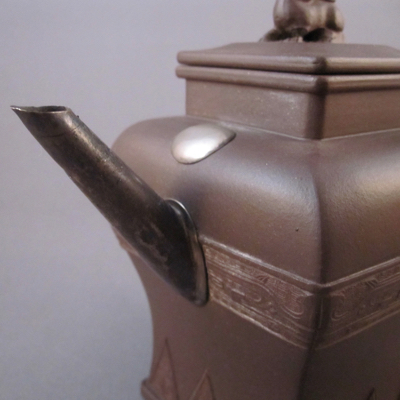 It measures 7-1/2″ from spout to handle and is about 4″ high to top of finial. 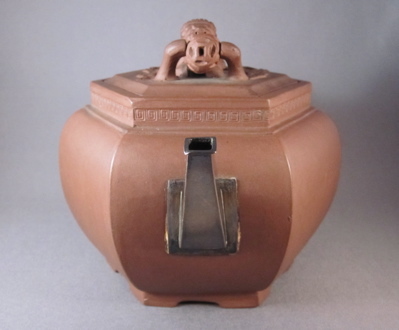 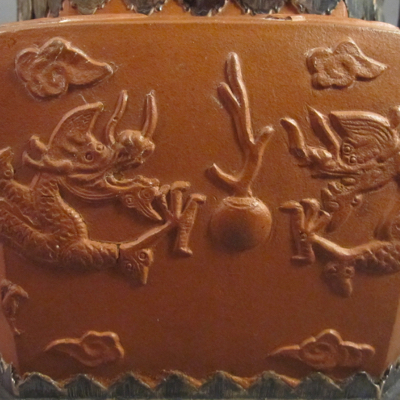 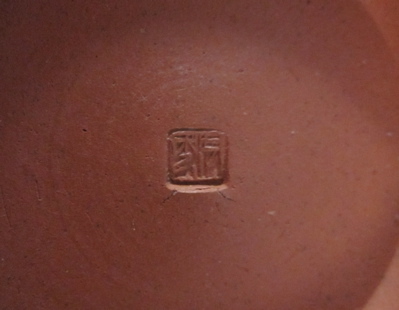 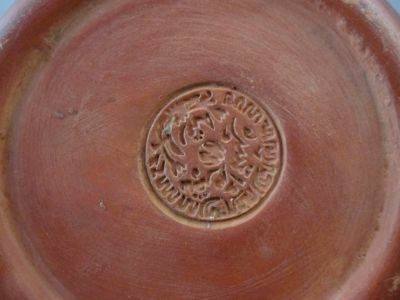 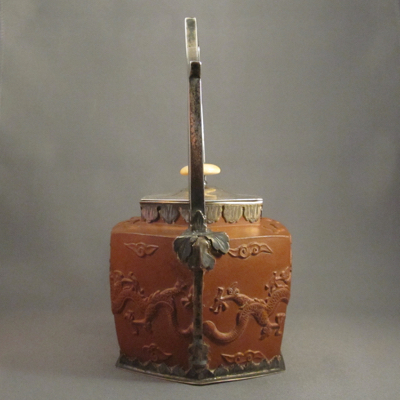 The shape appears to be typically Yixing but the brass lid, spout and horizontal strap, as well as the unusual incised mark on the underside, made me a bit suspicious. 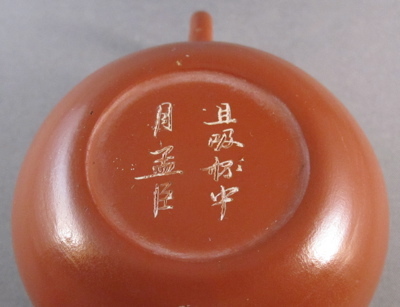 Now I feel the teapot dates from the latter part of the 19th century and was made in China for export to the Middle East, and that the mark on the base is Arabic. 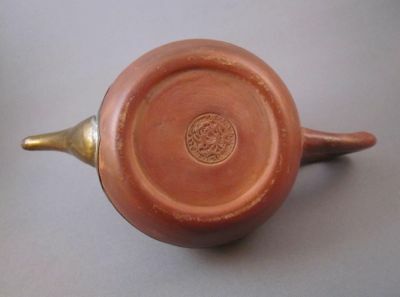 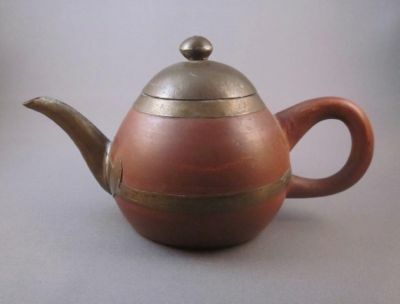 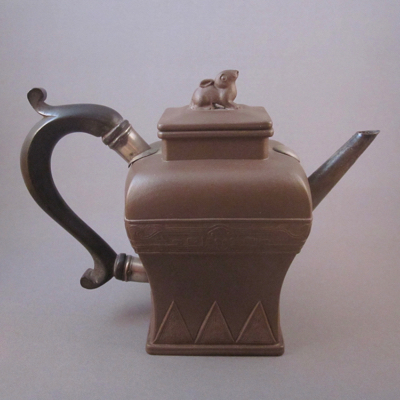 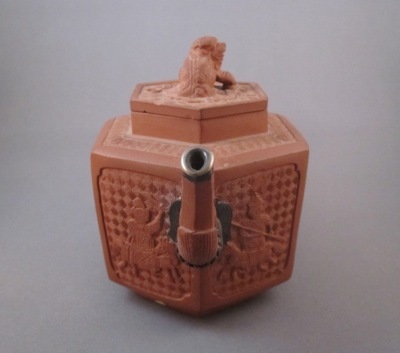 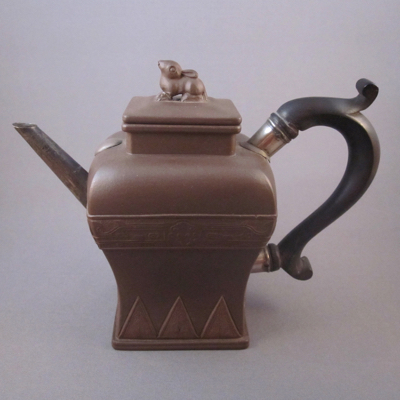 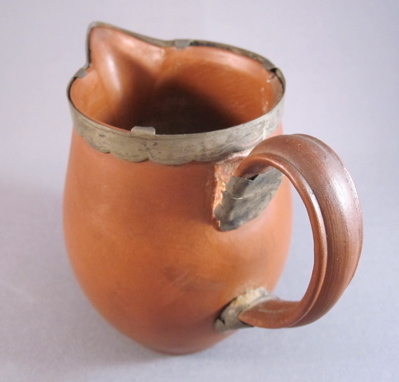 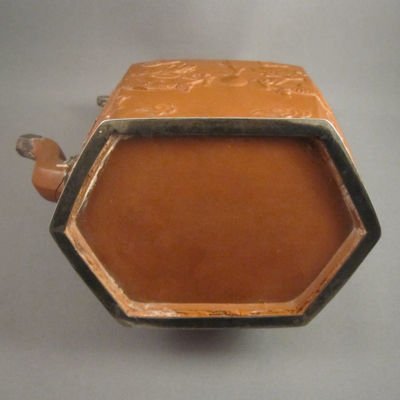 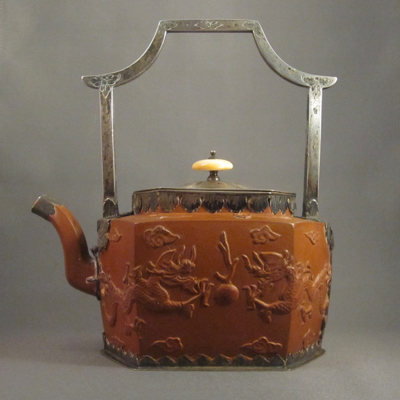 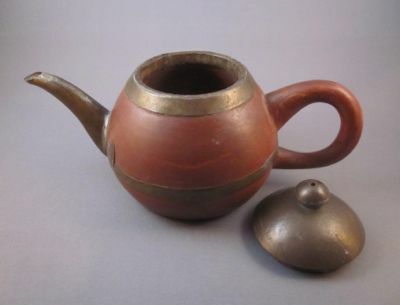 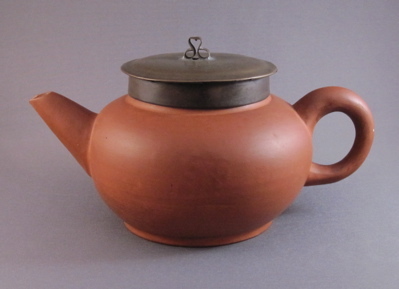 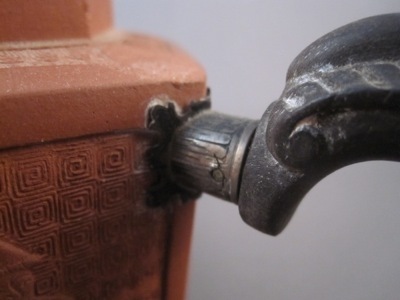 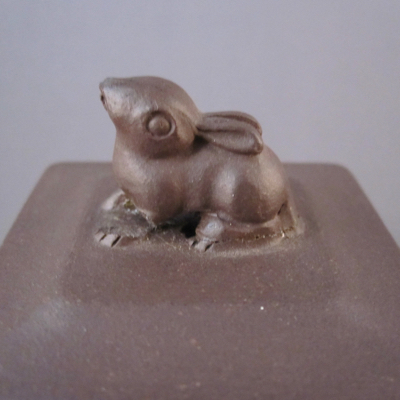 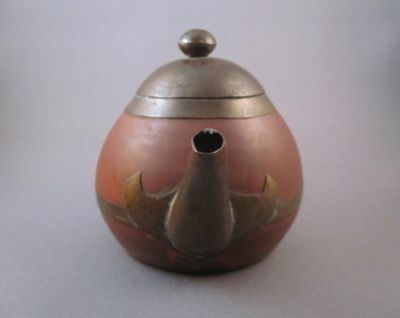 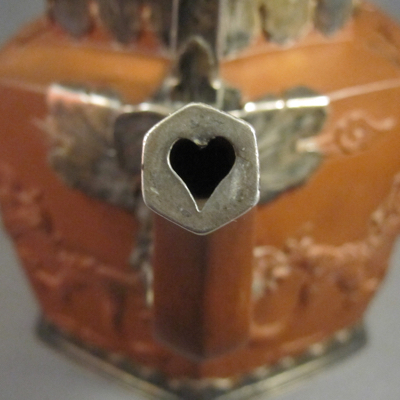 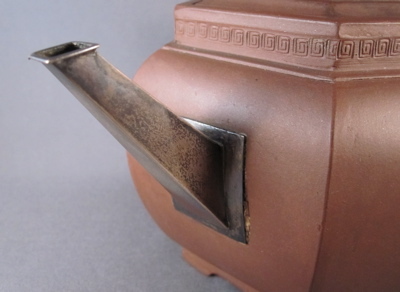 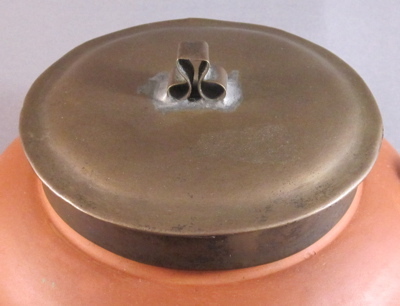 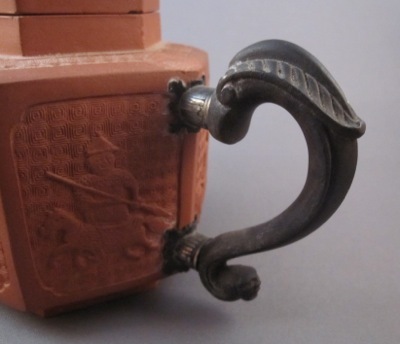 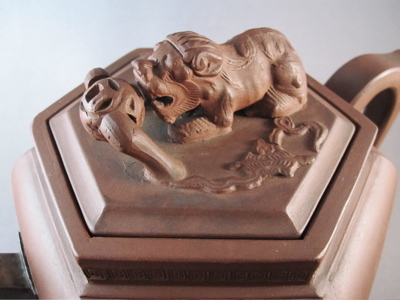 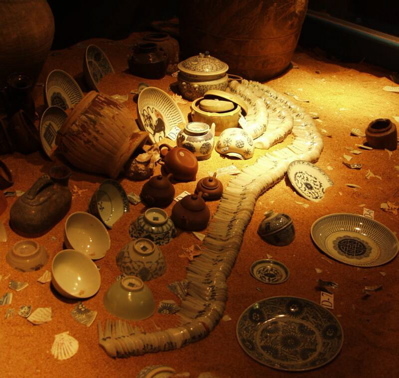 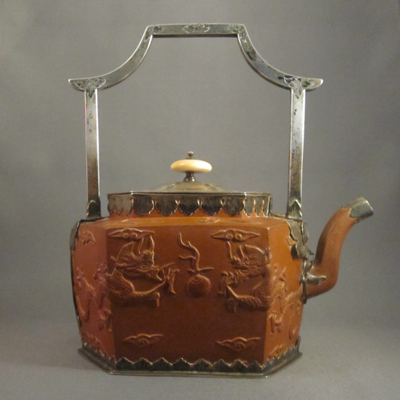 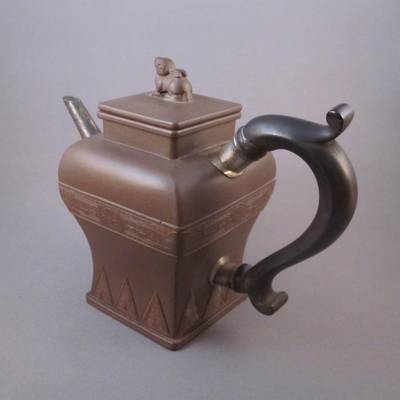 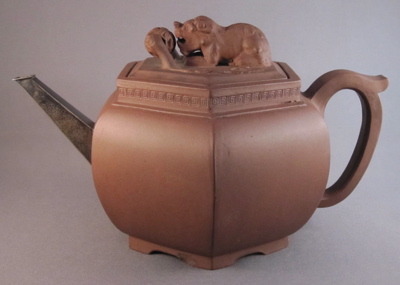 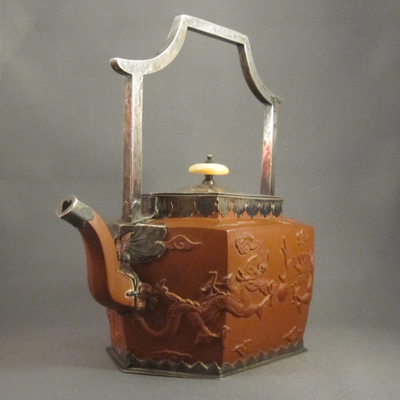 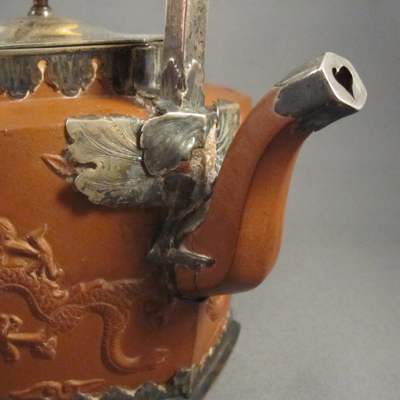 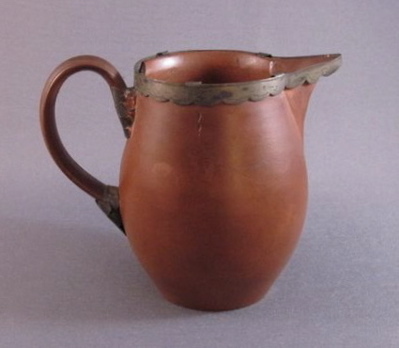 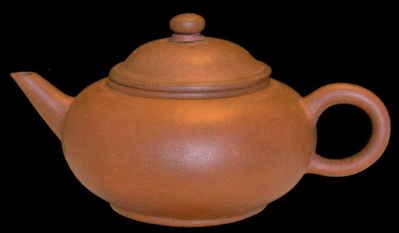 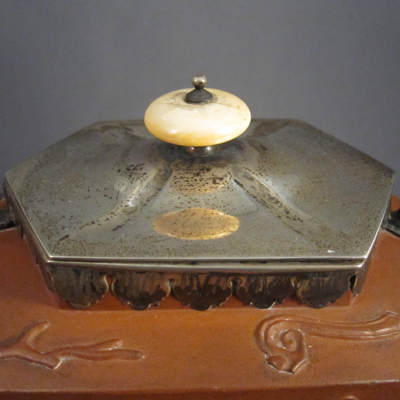 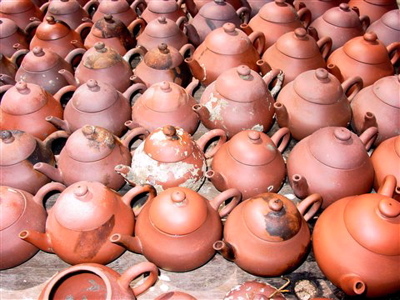 The brass spout and lid were most likely a part of the original design to help prolong the life of the teapot and not added to replace broken or missing parts. 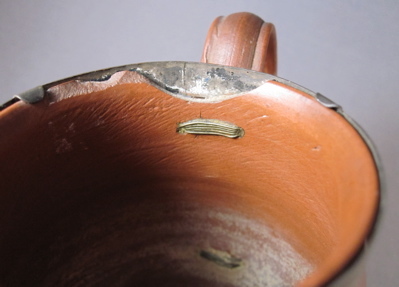 Learning to know the difference between a piece with an inventive repair and a piece that was designed with metal mounts can be a valuable, though sometimes a costly, lesson. 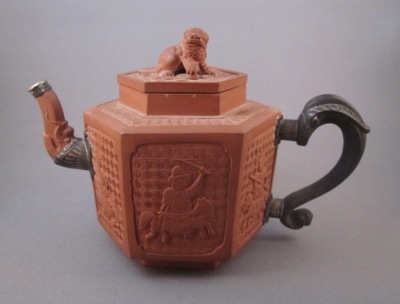 Luckily, I did not pay very much for this “not-a-make-do” teapot. 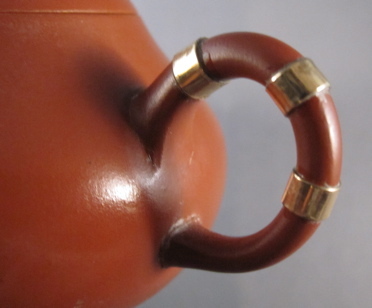 Simple yet elegant Chinese barrel form jug dates from the late 1700’s, stands 3-1/4″ high. 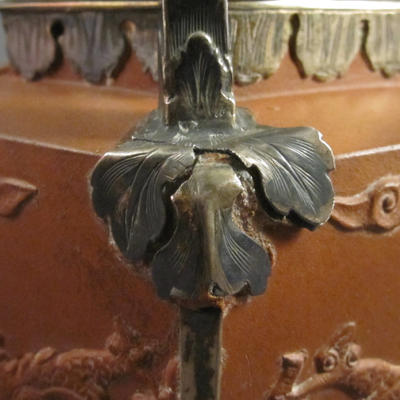 The broken applied handle is held back in place with engraved silver cuff repairs. 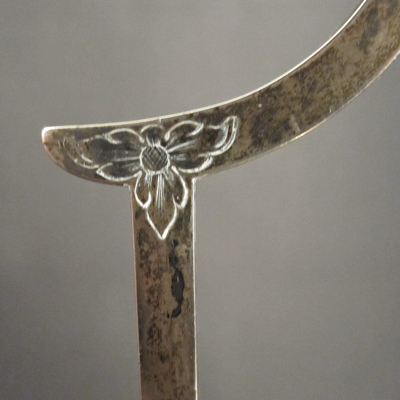 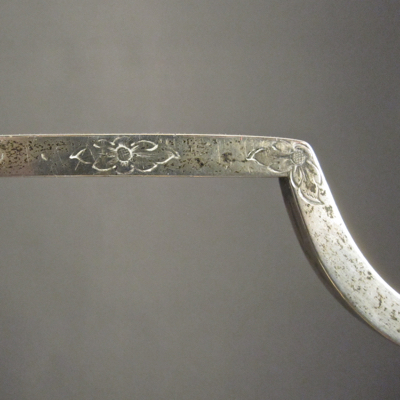 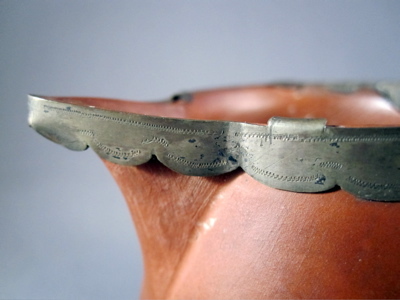 A silver band with decorated scalloped edge is clipped on to mask the damaged rim. 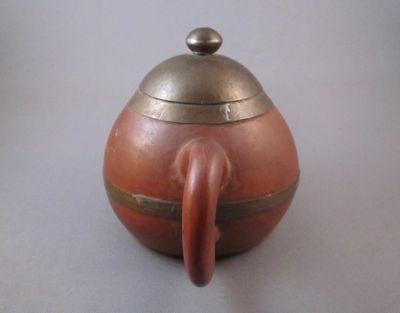 There is a maker’s mark on the bottom. 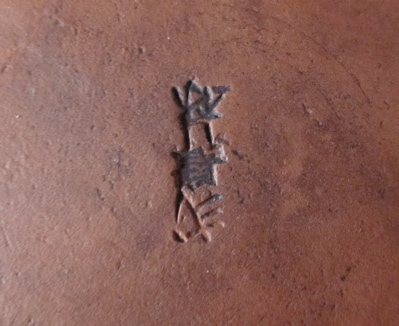 Apologies if I have not shown it right side up. 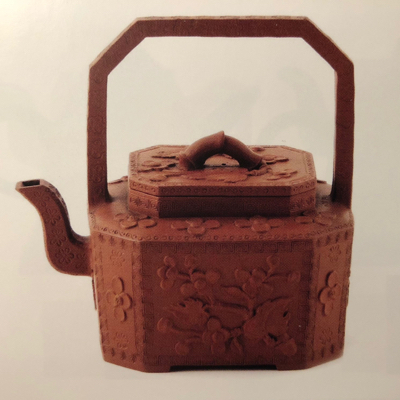 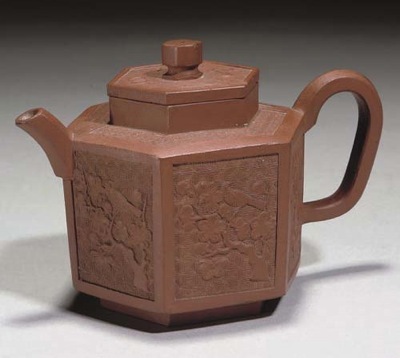 This Yixing (pronounced ee-shing) pottery teapot with paneled body and bracket base is made of purple clay and was meant for use with black and oolong teas. 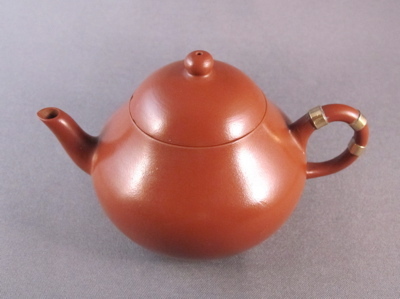 Teapot measures 5-1/2″ high, 8-1/2″ wide. 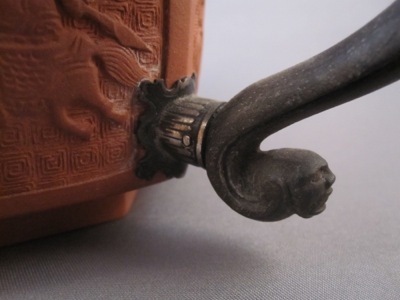 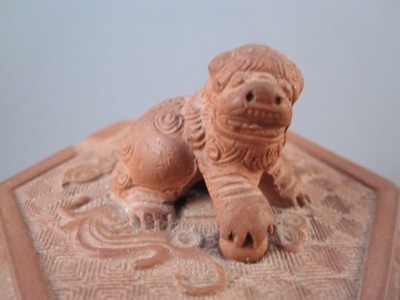 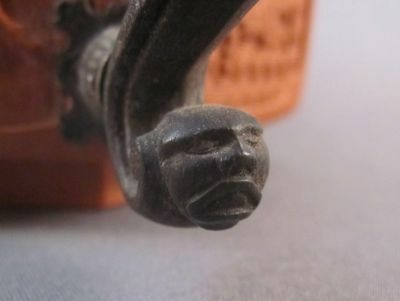 Lid features a wonderfully detailed dog finial with movable pierced marble ball. 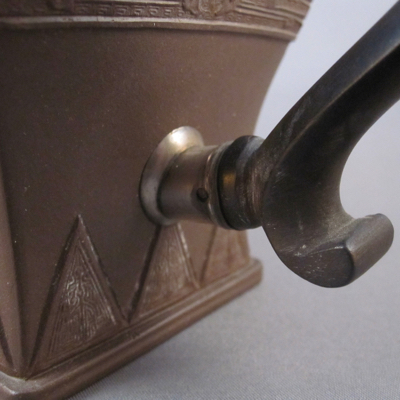 Damaged spout was replaced by this beautifully crafted silver replacement. 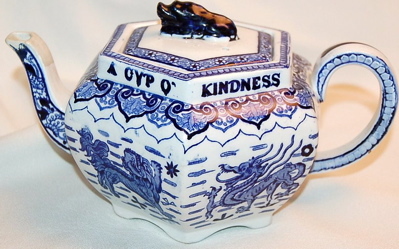 This Copeland Spode teapot with a similar shape was made in England, c.1879.